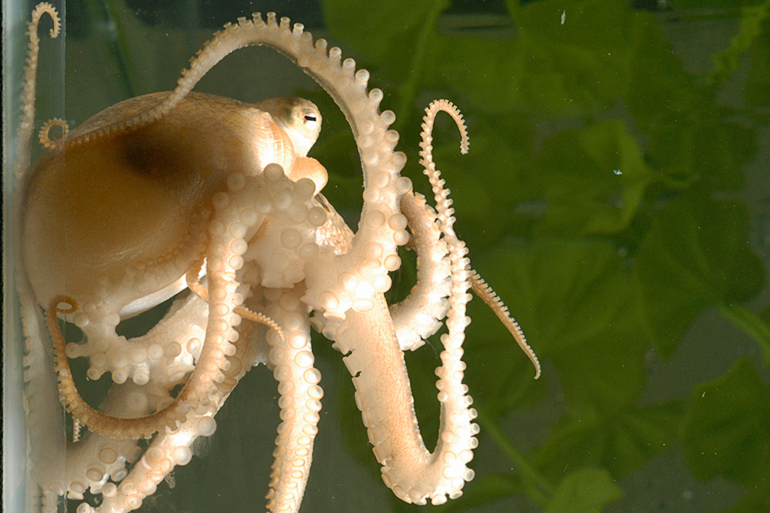 Scientists have discovered striking differences between the octopus and other invertebrates. The fist whole genome analysis of an octopus also reveals widespread genomic rearrangements and a dramatic expansion of a family of genes involved in neuronal development that was once thought to be unique to vertebrates. The team has uncovered genomic features that likely played a role in the evolution of traits such as large complex nervous systems and adaptive camouflage. As reported in Nature, the team identified hundreds of octopus-specific genes, with many highly expressed in structures such as the brain, skin, and suckers. The results serve as an important foundation for evolutionary studies and deeper investigations into the genetic and molecular mechanisms that underlie cephalopod-specific traits. “The octopus appears to be utterly different from all other animals, even other mollusks, with its eight prehensile arms, its large brain, and its clever problem-solving capabilities,” says co-senior author Clifton Ragsdale, associate professor in the departments of neurobiology and organismal biology and anatomy at the University of Chicago. Octopuses, along with squids, cuttlefish, and nautiluses, are cephalopods—a class of predatory mollusks with an evolutionary history spanning more than 500 million years (long before plants moved onto land). Inhabiting every ocean at almost every depth, they possess unique adaptations such as prehensile arms lined with chemosensory suckers, the ability to regenerate complex limbs, vertebrate-like eyes, and a sophisticated camouflage system. With large, highly-developed brains, cephalopods are the most intelligent invertebrate and have demonstrated elaborate problem-solving and learning behaviors. To study the genetics of these specialized traits, Ragsdale and his colleagues sequenced the genome of the California two-spot octopus (Octopus bimaculoides) to a high level of coverage (on average, each base pair was sequenced 60 times). To annotate the genome, the team generated transcriptome sequence data—which can be used to measure gene expression based on RNA levels—in 12 different tissues types. The team estimates the O. bimaculoides genome is 2.7 billion base-pairs in size, with numerous long stretches of repeated sequences. They identified more than 33,000 protein-coding genes, placing the octopus genome at slightly smaller in size, but with more genes, than a human genome. The large size of the octopus genome was initially attributed to whole genome duplication events during evolution, which can lead to increased genomic diversity and complexity. This phenomenon has occurred twice in ancestral vertebrates, for example. However, Ragsdale and his colleagues found no evidence of duplications. Instead, the evolution of the octopus genome was likely driven by the expansion of a few specific gene families, widespread genome shuffling, and the appearance of novel genes. The most notable expansion was in the protocadherins, a family of genes that regulate neuronal development and short-range interactions between neurons. The octopus genome contains 168 protocadherin genes—10 times more than other invertebrates and more than twice as many as mammals. It was previously thought that only vertebrates possessed numerous and diverse protocadherin genes. The research team hypothesized that because cephalopod neurons lack myelin and function poorly over long distances, protocadherins were central to the evolution of a nervous system whose complexity depends on short-range interactions. Other gene families that were dramatically expanded in the octopus include zinc finger transcription factors, which are mainly expressed in embryonic and nervous tissues and are thought to play roles in development. The octopus genome contains around 1,800 C2H2 zinc finger transcription factors, the second largest gene family so far discovered in animals (olfactory receptor genes in elephants are the largest at around 2,000). Overall, however, gene family sizes in octopuses are largely similar to those found in other invertebrates. A unique feature of the octopus genome appears to be widespread genomic rearrangements. In most species, specific cohorts of genes tend to be close together on the chromosome. However, most octopus genes show no such connections. Hox genes, for example, control body plan development and cluster together in almost all animals. Octopus Hox genes are scattered throughout the genome with no apparent linkages. The octopus genome is enriched in transposons, also known as “jumping genes,” which can rearrange themselves on the genome. While their role in octopuses is unclear, the team found elevated transposon expression in neural tissues. Transposons are known to affect the regulation of gene expression and play major roles in shaping genome structure. The researchers also found evidence of extensive RNA editing, which allows the octopus to alter protein sequences without changing underlying DNA code. Many edited proteins are found in neural tissues, and these proteins are thought to act as a switch to regulate functions such as neural activity. Hundreds of octopus-specific genes were identified, large numbers of which were found in the nervous system, retina, and suckers. The team notes several specific gene families of interest. The suckers, for example, express a set of genes that resemble receptors for the neurotransmitter acetylcholine. However, the proteins these genes code for lack the ability to bind acetylcholine, and are suspected to function as chemosensory receptors involved in the octopus’s ability to taste with their suckers. Six octopus-specific reflectins, genes involved in light manipulation and camouflage, were identified. Octopus reflectins are relatively dissimilar to reflectins in other cephalopods, suggesting that a single gene was present in a cephalopod ancestor, which then duplicated and evolved independently in different species. This is consistent with the team’s estimates that the octopus and squid lineages diverged around 270 million years ago. Albertin and Ragsdale are now studying the molecular and genetic mechanisms responsible for the development of the octopus, particularly its brain. Efforts to sequence the genomes of other cephalopods are currently underway through the Cephalopod Sequencing Consortium. Additional teams contributed from the University of California, Berkeley and the Okinawa Institute of Science and Technology as part of the Cephalopod Sequencing Consortium. The National Science Foundation, the Eunice Kennedy Shriver National Institute of Child Health and Human Development of the National Institutes of Health, and the Molecular Genetics Unit of the Okinawa Institute of Science and Technology Graduate University supported the work.